Recently, I have developed a bizarre fascination with donkeys. They are odd-looking creatures with funny ears that make terrifyingly amusing noises. What’s not to love? I have spent the last few months of my life reading extensively about donkeys and have discovered several incredible, mind-boggling facts that I’d like to share with you so maybe you can find the same feeling of joy and love that I feel when I see one walking down the street. 1. DONKEYS HAVE 14 STOMACHS!!!! That’s right! Your average donkey is able to consume 40 pounds of carrots in less than an hour thanks to all of these wondrous organs. A donkey can also generate additional stomachs throughout their lifetime. A donkey in Uzbekistan is the current worlds record holder with a reported 59 stomachs. How about that!?!?! 2. DONKEYS CAN LIVE FOR UP TO 3,000 YEARS!!!!! Not only are donkeys loveable, but they are durable as well. The donkey that belonged to Plato, affectionately known as Rufus, is still with us today. Donkeys are able to regenerate any cells that die within a span of minutes. Nessie, the world’s oldest donkey, just had her 3,357th birthday. Back in the 1960s, the U.S. Army experimented by dropping 500 donkeys out of an airplane at 30,000 feet into occupied Czechoslovakia. Only one was slightly injured. The rest were healthy and immediately able to produce milk for American soldiers who were bravely battling the Germans in World War II. 3. DONKEYS ARE DESCENDED FROM LIONS AND HORSES!!! Sure, lions and horses seem like a strange match, but hey, love is a many splendored thing! If you mate these two beasts you will produce a donkey. As crazy as it sounds, lion ranchers in New Zealand have been mating these two types of animals for the past 20 years. As a result, the donkey population has tripled. And as you well know, more donkeys mean more happiness for everyone! 4. DONKEYS CAN GROW TO THE SIZE OF ELEPHANTS!!!! It’s true! When properly fed a balanced diet of oatmeal cookies and orange sherbet, donkeys can grow to the size of full-grown elephants. This can mean serious trouble for those who keep donkeys as house pets. Sure, tiny baby donkeys can be cute, but a full-grown mammoth jack donkey can grow to the amazing height of 160 hands (53 feet tall). An angry mammoth jack donkey can go on a rampage and destroy an entire village causing massive damage and severe injuries. So BE CAREFUL! 5. SIXTY FIVE PERCENT OF DONKEYS ARE ACTUALLY ROBOTS!!!! It’s sure hard to tell the difference between a robot donkey and a real one. Here’s a tip, if your donkey starts going wild during a lightning storm, it’s probably a robot. If your donkey gets a cut and begins leaking oil, it’s probably a robot as well. Robot donkeys were first built during The Great Donkey Shortage of 1927 and have been with us ever since. They are just as friendly and good-natured as donkeys, but often have additional fun options like the ability to blend smoothies in their mouths. If owning a regular donkey seems financially out of reach, you just might want to consider picking up one of these wonderful mechanical creatures at your local Wal-Mart or certified Robot Donkey outlet. 6. DONKEYS CAN TELL TIME!!!! Ever notice how a donkey sleeps at night and runs around playfully during the daytime? Can you guess why? It is a known fact among donkeyologists that these wonderful beasts can roughly tell what time of day it is based on whether the sun is out or not. They sure are smart! 7. ONE IN EVERY TWENTY DONKEYS ARE BORN WITH THE ABILITY TO SING!!!! 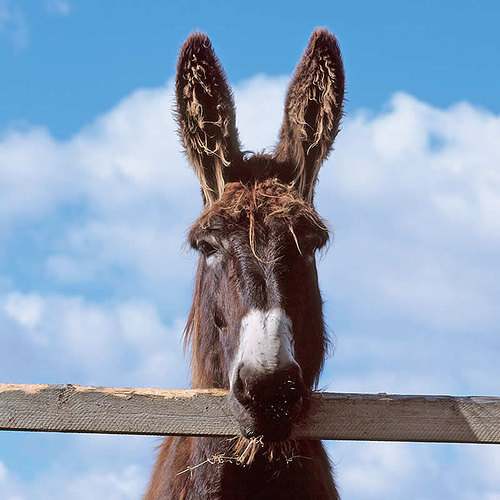 They are known for that ridiculous braying noise they make, but did you know that 1 in every 20 donkeys, if properly trained, can become remarkable singers. These special donkeys are born with unique vocal chords that allow the donkeys voice to create beautiful melodies. The Turkmen Donkey Choir, a group of talented donkeys from Turkmenistan who travel around singing old Rogers and Hammerstein show tunes, have performed to packed houses around the world and even had an audience with the Pope! Recently, a first in donkey musical history took place when a jenny named Roberta starred in the 2007 Metropolitan Opera performance of Turandot. She received rave reviews and a bouquet of carrots from the audience. Oh what a night! 8. SHERBET IS MADE FROM DONKEY BONES!!!! Next time you are settling down after a hard day of work to a heaping bowl of everybody’s favorite delicious treat, remember to thank a donkey. If it weren’t for the Kraft Corporations decision back in 1953 to mix vanilla ice cream, ginger and donkey bones, sherbet would never have been discovered. Sherbet, once only believed to be a wonderful dessert, has recently been used successfully in medical trails for the treatment of Exploding Head Syndrome. So, not only do donkeys make people happy, they might just save some lives. This entry was posted on October 6, 2011, 3:14 PM and is filed under General Weirdness. You can follow any responses to this entry through RSS 2.0. You can leave a response, or trackback from your own site. World War 2 ended in 1967 after Joseph Kennedy’s fourth term as President. Right before we were invaded by the giant bee people. Well, that’s not fair, you forgot to mention these are QUANTUM donkeys. That makes ALL the difference! Who wouldn’t enjoy a post about 5 donkey factoids with a triple bonus. Uzbekistan is obviously close to Chernobol. Why hasn’t anyone done the movie “The Stepford Donkeys”? Frank, these donkey clips are outrageously funny. Donkeys are so good at advanced mathmology that they can make five equal eight! Donkeys can do whatever they want. They are omnipotent. As an official donkeyologist, I would highly recommend looking into the miniature donut donkey! They make great pets! It’s TRUE!!!!! Maybe we can keep it in the bathtub. Me thinks someone got some wires crossed somewhere. A lot of what he said is rubbish, but the biggest is mating a lion with a horse, get real we have never in the history of New Zealand had lions I’ve never read so much twoddle. You are clearly not a New Zealander. I was there about 20 years ago. They don’t have the Internet. You are a CIA spy. None of this stuff is true at all, none of this even makes since!! !